Cavetale has a central location where players can trade with each other called the Market. While shop creation is possible anywhere in the world, this is the place where people usually go to look for a bargain. There are a couple of commands to get around and find items on the market. The output of the search command is clickable, so you can be ported automatically if you see an item in the list that you are interested in. /market or /shop market – Warp to the market spawn. /shop search [keyword] – Search the market for items matching the item in your hand or the keywords. /shop search! [keyword] – Same as above, but search for exact matches. /shop search -sell [keyword] – Search the market for items being bought by others. /shop search -owner [name] – Search by shop owner. Lists deals only from that player. /shop port [owner] – Warp to someone’s shop, or your own shop. This is free of charge. /shop trust [player] and /shop untrust [player] – Give someone else permission to build within your plot. /shop setspawn – Set the spawn location of your plot. /shop search diamond pick – Search for anything containing the words “diamond” and “pick”. /shop search! diamond – Search for diamond items. /shop search -owner StarTux – Lists what StarTux has for sale. /shop port – Warp to your own shop. /shop port StarTux – Warp to StarTux’ shop. A whole world is dedicated to our market. You can reach it by typing /market or by following the appropriate portal at spawn. The market can be expanded on demand to the North and the South. The market follows a canal that flows through its center. 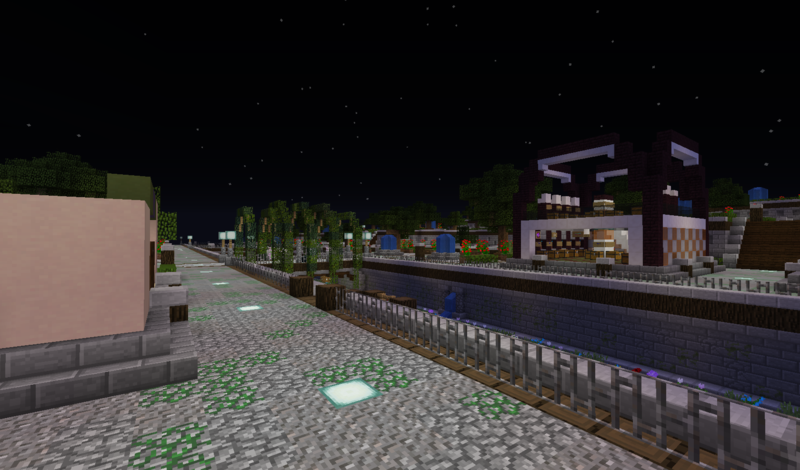 It is organized into four lanes, 2 of each side of the river, leading away from the market spawn in different directions. Each lane has an upper and a lower level. Once you have acquired adequate wealth and reached the Member rank, you can purchase a plot in the market for 5,000 Coins. To do so, find an empty plot, or use /shop auto to find one which has not yet been claimed. While standing in the plot you selected, type /shop claim. The plot is now yours and you can start building a shop. There are two ways of making a shop chest to sell items. One uses a sign, the other uses a named chest. You can also make a chest that buys items from people. All these possibilities are detailed in the main article (see above). Absolutely no griefing or stealing is tolerated on the marketplace. Only build inside your own plot. No buildings taller than 25 blocks are allowed. No scamming. Make your offers fair and transparent. Don’t use fire in your design. It is noisy and makes people lag. No unnecessary towers which don’t contain shop chests. Shops that violate the rules may be altered or removed at the staff team’s discretion. Whenever you are in doubt about the interpretation of the rules, feel free to ask a staff member for advice or assistance.